Well our first race for the forum has been run and won and what a great night it was. We ended up with ten runners vying for a number of prizes. 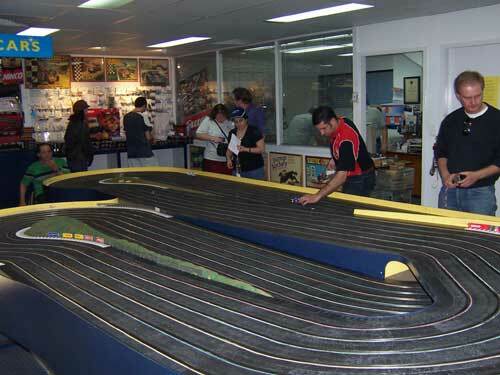 The race format consisted of two rounds of 10 minute heats across the six lanes. 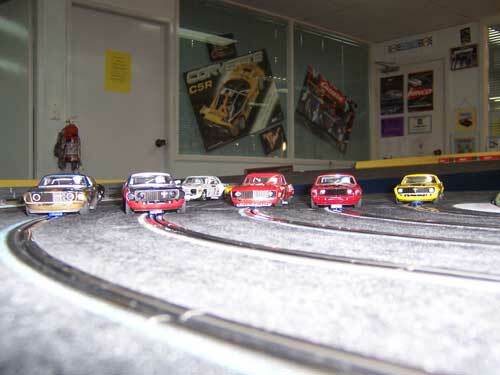 The first round was divided into the six drivers in the grid shot below with heat one of ten minutes. The computer would then randomly pick the next lanes for the drivers to move to with one minute to change lanes and place the lane sticker on the car. Once all the heats were run the second lot of drivers completed their heats. As two did not turn up there were four drivers for this round. The finals were the top five on laps in the "A" final with the five completing the lesser number of laps in the "B" final. The finals were five minute sprints across the six lanes. 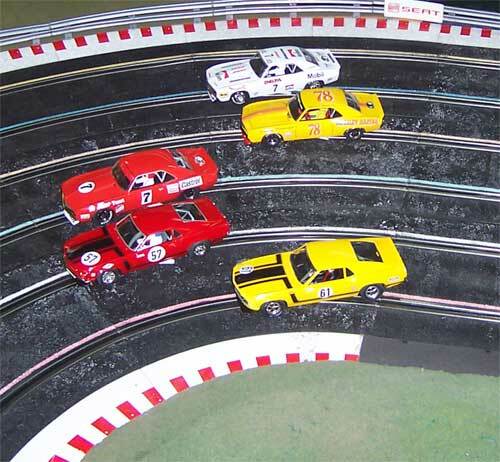 The format of Scalextric Camaro and Mustang with a button magnet only proved to be a great race format which will be raced again. Both cars were even with times being very similar and the places mixed between marques all down the field. I found the Mustang to work well by braking deep into the corners and driving through without too much drifting of the tail and then getting hard on the throttle as the car came onto the straight. I noticed the Camaro's seemed to be driven with a bit more tail out than the Mustang with Bo's in particular liking the wall coming onto the main straight. I am sure there is a gold strip all the way through that corner. See the pics below for a look at the nights procedings. Here we have Glenn getting a head start on the rest of us getting dialed into the track. Jamie is giving his Penske Camaro its first run proving you don't need a run in car to be competitive. The start of the first heat for the night and we have from the red lane going across the grid. Joe with his Devious Dave repainted Camaro. Devious Dave with the Orange Mustang. Rob Evans with his repaited Mustang. Jamie or Skaify as he became known tonight with the Blue Camaro. Jamies hired gun and only lady driver Josephine. Myself with the no16 Folmer Mustang. A couple of pics set up after racing with the lower shot of the two showing Bo's fantastic looking gold and black Camaro on the left. It looked too good to race but the clearcoat held up well for those roof slides down the hill. This setup shot shows the no 78 Camaro raced by Pete and painted by Devious Dave and the no 61 yellow Mustang of Michael as painted by Bo from a kit body. The Bob Jane Camaro did not race and either did Bo's red Stang. Here is overall winner from the "A" final Joe collecting his prize from Bo. As usual Joe was fast and consistent setting the fastest lap for the night as well as winning and running away as the final rounds wore on. 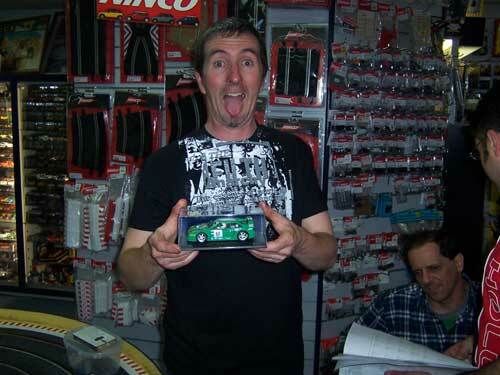 Joes prize of a Ninco track set was kindly donated by ARMCHAIR RACER. This is the reason there have been no photos of myself on the forum before. I had a great dice with Joe and was just ahead of him starting the third heat of the finals. Unfortunately I didnt plug in my controller properly and allowed Joe to get in front. From there I slowly lost ground and Joe ended up a 5 lap winner over the final four heats. 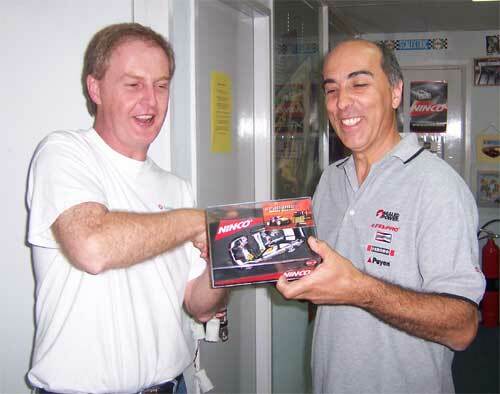 My second place prize of a Fly Venturi was also kindly donated by ARNCHAIR RACER. 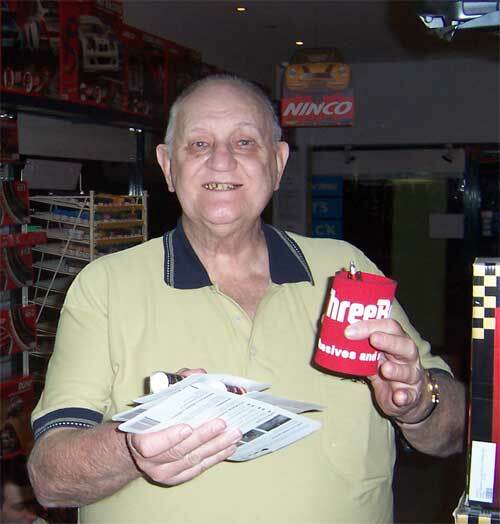 Devious Dave collected his Three Bond prize haul for third place in the "A" final. Dave is very consistent as well as fast and always finishes high up the order. Glenn collects his first place prize for a great win in the "B" final. 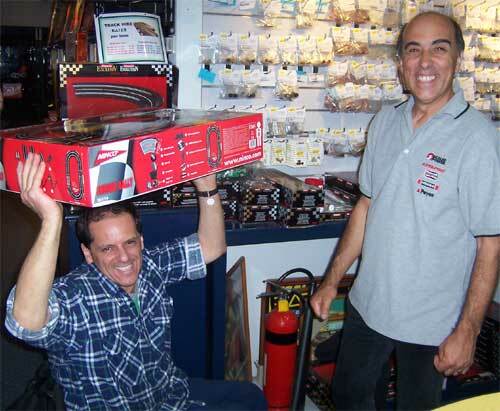 Bo reluctantly hands over the prize of a Ninco M3 kindly donated by GRAHAMS HOBBIES in St Marys in western Sydney. Glenn and Bo had a great tussle for first but Glenn won out this time. Michael also put up a good showing for a first time racer and first drive on the track. Again many thanks to Jim Berry from Armchair Racer for providing the track and a well run race program with a slick timing and also some great prizes which were well recieved. Thanks also to Graemes Hobbies for putting up first place in the 'B' final and Three Bond lubricants and adhesives for the consolation prizes. Looks like a great event, and a lot of fun. I was driving around the countryside on a vintage car rally for 2 weeks, and would have loved to been there. Awesome work guys and nice to put some faces to names and personalities. sliding around corners and fish tailing up the straight. Thanks to all the Auslot members that turned up for the race and hope to see more for the next round. We would also like to thank Armchair Racer , Graham's Hobbies and Threebond lubricants & Adhesives for donating the prizes. 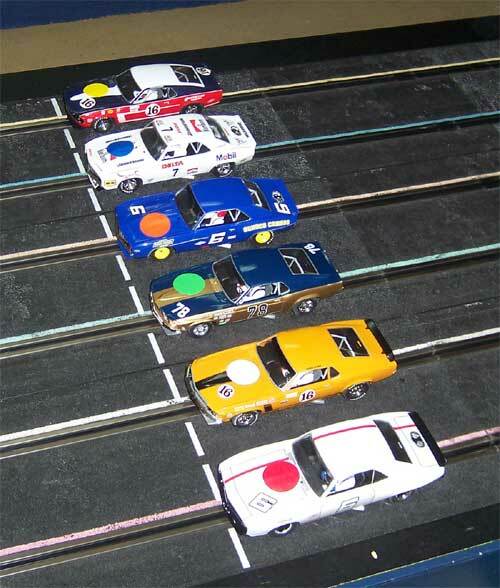 We also would like to thank Jim Berry from Armchair Racer for providing Auslot with a very fast track to race on. You can see from these results that the Heat 2 drivers were clearly superior marshalls to their Heat 1 counterparts. While the Heat 1 drivers may snigger at this idea, they would do well to remember the CARnage of bracket 6 of their race yet the completed laps average was maintained, with 2 fewer marshalls than their turn at marshalling!!! By bracket 6, we had the swing of getting RobE's car back on in the blink of the eye The sheer rat cunning of the older Heat 2 drivers had worked out that Joe was likely to score the A Final prize so next best was B Final prize. Were we THAT obvious ? All jokes aside, you can see from the results that the cars were very evenly matched and the differences were the result of driver skill, with only a little luck playing a part. Vinno's car lost a front wheel in one of the early parts yet the lap times got better after quick repairs using a bit of scrap paper to jam the wheel on. Jamie's car adopted a Skippy style of handling (tyre moved off the rim?) and bounced its way around the track mid-race, which is why his laps dropped. Joe always starts fast and maintains the pace, setting himself up as the car to catch. After grabbing a lead, he then starts to push harder to break the rest of us and it works. In the heat 1 results, you could throw a blanket over the runners-up (please!) with only 5 laps between 2nd and 5th. Heat 2 raced to a plan, a bold and devious plan to conserve our cars and ourselves. Besides, we'd spent a hectic hour marshalling BEFORE our race so we were tired from all that work. Here is the A final results,very close racing indeed. A quick note about the race format. The lap-scoring computer controls power to the track. At the end of each timed bracket, the computer powers down the track. Drivers changed lane colour stickers and moved their car across to the next race lane, in line with where they stopped. The computer was set to detect "short" laps in case a deslotted car in the wrong lane crosed the lap counter. Jim set it to detect laps < 6.5 seconds. Thus it was not in a driver's interest to crib a few feet/metres at the lane change else they risked the wrath of the lap-counting computer (detecting a short lap) and the other drivers. So in the posted results, the lapcounter only shows completed laps which can give a misleading picture. What is reported as a lap difference may in fact be one car just passed the lap counter and one just behind it. The racing and dicing was even closer that the stats show. A very close race but MOST ENJOYABLE. Congratulations Everybody! So you all enjoyed it well as shown from all the pictures. geez you dug this up! Almost as good as a St Andrews race night.